Just earlier today, Nokia’s upcoming smartphones, the Nokia 1 Plus and 9 PureView were added to the list of devices supported by Google Play. Now, both of the handsets have been certified by the Federal Communications Commission (FCC). The FCC certifications have revealed a few important details about these phones like their model numbers of various markets, as well their network variants. 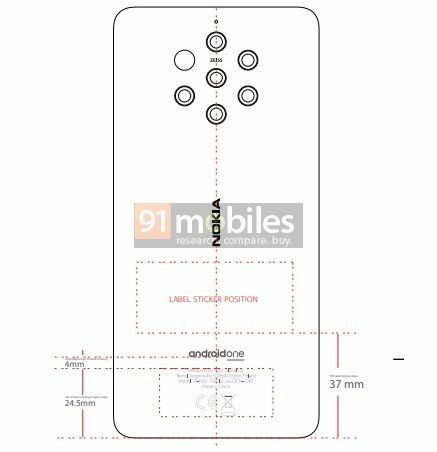 Talking about the Nokia 9 PureView first, the phone’s FCC listing contains the sketch of the smartphone, which confirms the presence of a five rear camera setup. The certification reveals that the flagship will be available in both single and dual-SIM variants, which will carry the model number TA-1082 and TA-1087/TA-1094, respectively. Furthermore, the listing suggests that in China, the device may not be available as an Android One offering, while the Taiwanese market has confirmed to receive this model. Notably, the certification confirms that the Nokia 9 PureView will feature wireless charging. As for the Nokia 1 Plus, the phone has received certification from FCC under several model numbers. The single-SIM variants of the device will carry the model number TA-1111 and TA-1127, while the dual-SIM versions will be released carrying the model numbers TA-1123 and TA-1130. The image of the device in the listing suggests that the handset will offer an 18:9 display, and will have single cameras on the front and rear, and a micro-USB port. Moreover, the certification suggests that the smartphone will come with a 2,500mAh battery and Bluetooth 4.2 connectivity. The Nokia 1 Plus and Nokia 9 PureView are expected to be unveiled at HMD Global’s pre-MWC 2019 event on February 24th. We will bring you more details regarding the upcoming phones as soon as anything pops-up on the web, so stay tuned for regular updates.